Boy do I have a lot to share with you today! 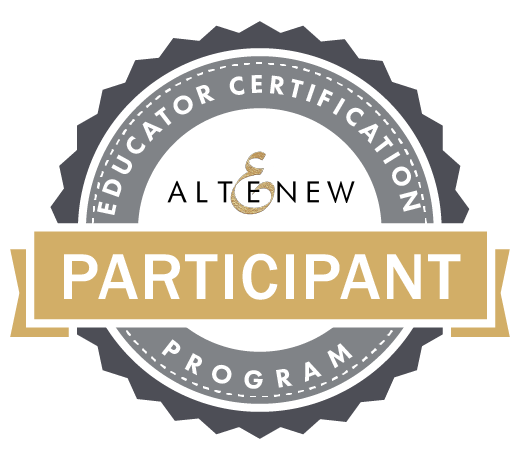 As you know, I have been participating in Altenew’s Educator Certification Program. This has allowed me (or should I say, given me the excuse) to take 10 classes in their Altenew Academy. I had actually completed 2 other classes prior to being accepted into their Educator Certification Program. I have enjoyed every minute of taking the classes! I feel reinvigorated and inspired to create and experiment with new techniques and tools. I can’t wait to get home from work every day and get into my craft room and do something crafty. My final project to complete Level 1 was to create 2 cards: Card 1 needed to be a masculine card or a card for a teenager, Card 2 needed to be a birthday or graduation card. Both cards need to include 3 techniques or tips that I learned in 3 different classes. I could not stop at 2 cards! I also essentially combined the two challenges in each of my cards. 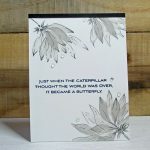 I focused on two stamp sets and then created several cards appropriate for teenagers and graduation. 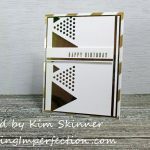 I did actually make an effort to make a couple of them birthday cards and I think the cards are all appropriate for both men and women, teens on up to Mom and beyond. My favorite card is the very last one at the end of this blog post, so hang in there because I have 6 cards to share! I pulled out two Altenew stamp sets: Happy Dreams and Space Travel. In the For the Guys class, they suggested space themes with artistic techniques using paints or inks. I can actually create a scene with the Space Travel set which I gleaned a lot of good ideas from in the Seasonal Scene Building class. I teach Physics and many of my students will be going on to college where they will major in engineering or physics. I have a least one young woman who is an aerospace engineer for NASA. This set is perfect for the teenagers I know! I selected Happy Dreams because the sentiments and images are to die for. Look at the sentiments on this card! 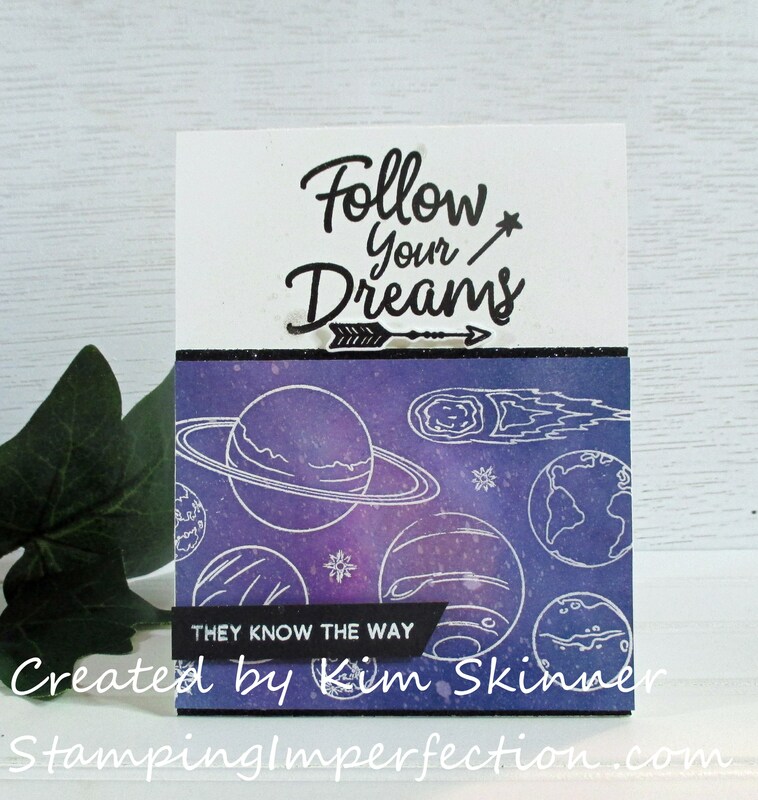 “Follow your dreams…they know the way.” I can’t think of a more perfect sentiment for a graduation card!! Graduation is an exciting time for a teen and they are dreaming big! This card uses an emboss resist inking technique from the Ink Blending class. I actually blended several colors of inks starting with a light pink, a couple shades of purple and two shades of blue to get that trendy night sky look. 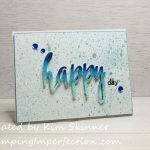 I spritzed the card to give it a faux watercolor look that I learned about in my Boutique Cards class. I have one small die cut for my Easy Die Cutting class and of course there is black glitter paper to Let it Shine! These are a clean and simple design using the same principles, but keeping the card with a lot of white space. Since I had created a scene on my clear block with the stamps, I had the same layout that could be used multiple time. I blended more colors here and embossed the images for an emboss resist technique. You can see that I also left out the ink splatter. 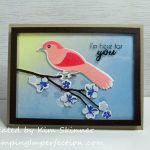 I added two lines of scoring above and below the image and I heat embossed the sentiment with gold embossing powder for the shine. I just wanted to experiment with a couple of different things. I really liked the simplicity of the layout here. I think these space scenes would be good masculine cards. Just a note: I did use some masking on these two cards. I have large post-it notes that I put above and below where I did my ink blending and stamping. I left them in place until I had the scene and ink blending finished. That gave me very clean lines in a defined area on the card. 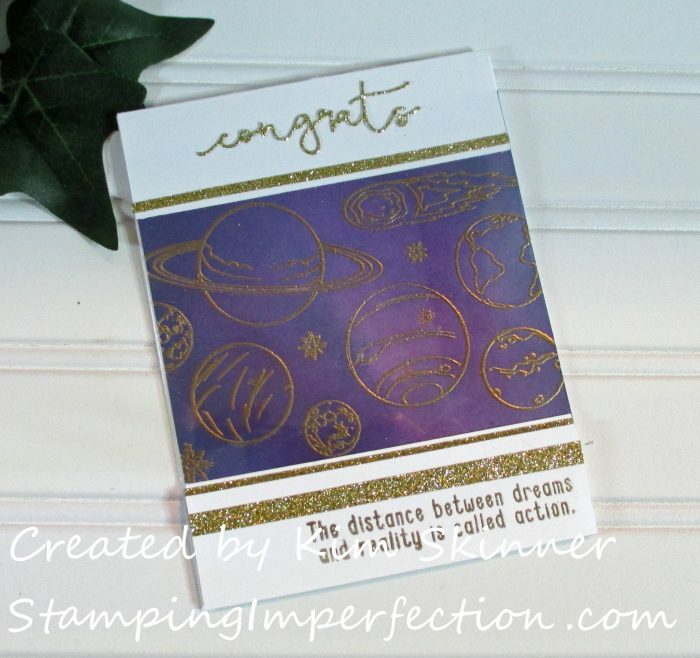 This is another space scene with a lot of shine and sparkle…I just couldn’t resist trying one that was a little over the top with another sentiment from the Happy Dreams set. This actually has a window sheet over the scene that you can’t see in the photo. I kept getting a reflection when trying to photograph it standing. Again, I’ve used ink blending and emboss resist, lots of shine on this one and a die cut sentiment along the top. Altenew has two sizes of word dies and this is the smaller one. I love how freeform it is and the size makes it nice for a card like this. I did not want that sentiment to be the focus of the card. I wanted that window space scene to be the focal point. Isn’t that sentiment at the bottom just perfect for a graduating senior? I felt like it just fit the space theme and graduation so perfectly. This is completely different from the other cards…I used the Happy Dreamer stamp set and one small flower from the Amazing You set. The sentiment comes from Label Love. The Happy Dreamer and Adore You sets both have coordinating die sets which I took advantage of for Easy Die Cutting. This is another fairly clean and simple card. 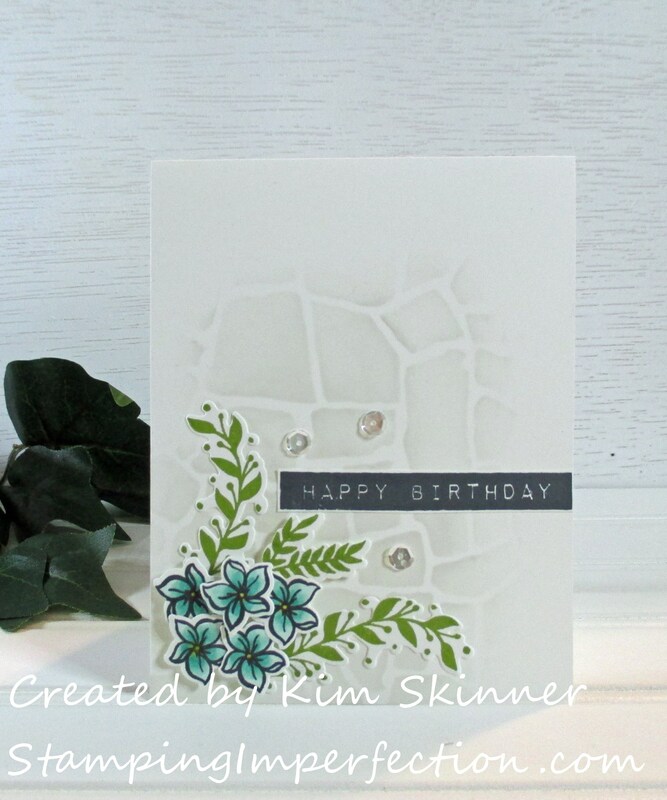 I started this card with the Stone Wall Stencil from the Celebrations Stencil Techniques and the Boutique Cards classes. I used Morning Frost ink and my ink blending tool to add a very light background on part of the stencil. It’s like a hint of a rock wall. The leaves come from the Happy Dreams set and they are stamped in Moss ink. The tiny flowers from the Adore You set are colored with alcohol makers in a teal color with a yellow center. 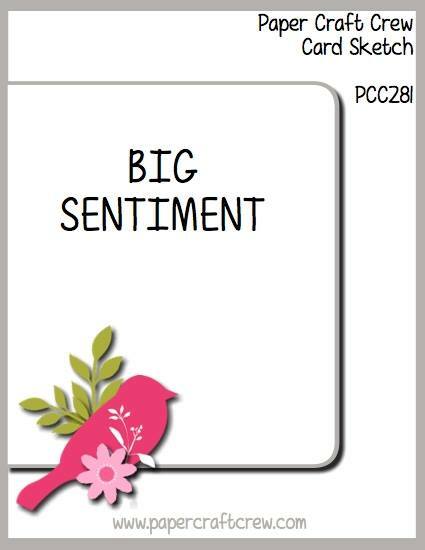 I love the Label Love sentiment set. It is still a trendy look and I like that I can leave no border, a little border or a ton of white around the border for a different look each time I use this. For the final touch and a little shine and sparkle, I’ve added some sequin embellishments to Let it Shine! I feel like the rock wall background, the label sentiment and the tiny blue flowers keep the card from being too feminine. This one is my favorite. 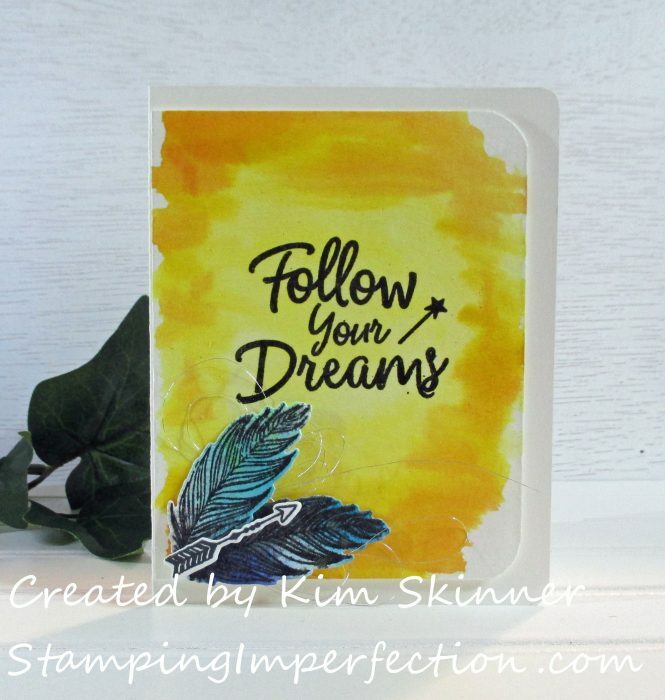 I had the sentiment stamped, the watercolor background done, and the leaves made when I realized that I needed my design team card for the Paper Craft Crew Challenge for today! The card layout uses the sketch for that challenge this week and the card is all from the Happy Dreams set. This is another card that I think is perfect for a teenager for graduation. I absolutely adore this stamp set. I think it makes perfect cards for teenagers and for graduation. I love this card because it feels artsy and more “me”. The sentiment is embossed in black. 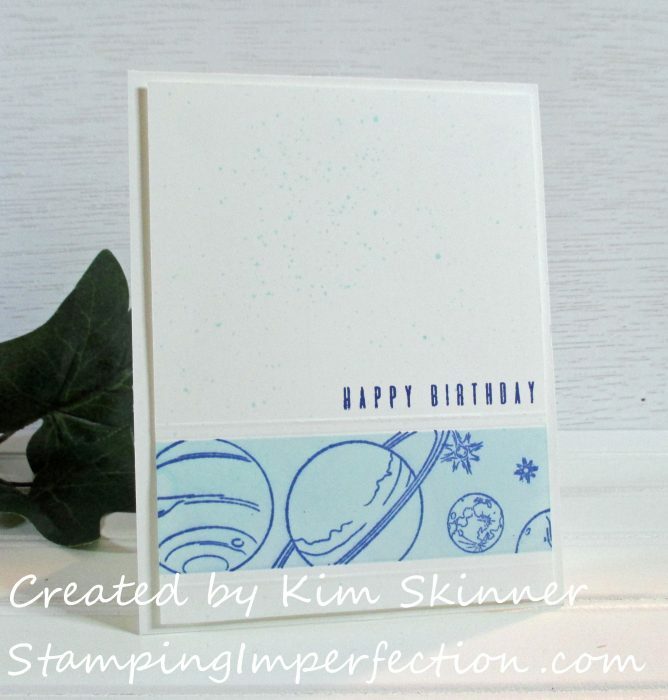 It’s a simple layout with that random watercolor from Boutique Cards. The instructor said not to be too careful with the watercoloring for a more boutique effect. The leaves are die cut and randomly watercolored in some blues and greens and those new teals…love those. I had to add the die cut arrow because I love it and we use arrows for everything in physics. I’ve also added some metallic silver thread behind my dies which I have layered on with foam tape. You can see that I rounded the edges of my image layer and my card. I pretty much kept to the sketch. Isn’t this an amazing sketch?! Check out the sketch here and check out this week’s Paper Craft Crew Challenge! Thank you for hanging in there until the end of this blog post! I would LOVE to know if you have a favorite card here. I really had a hard time deciding. 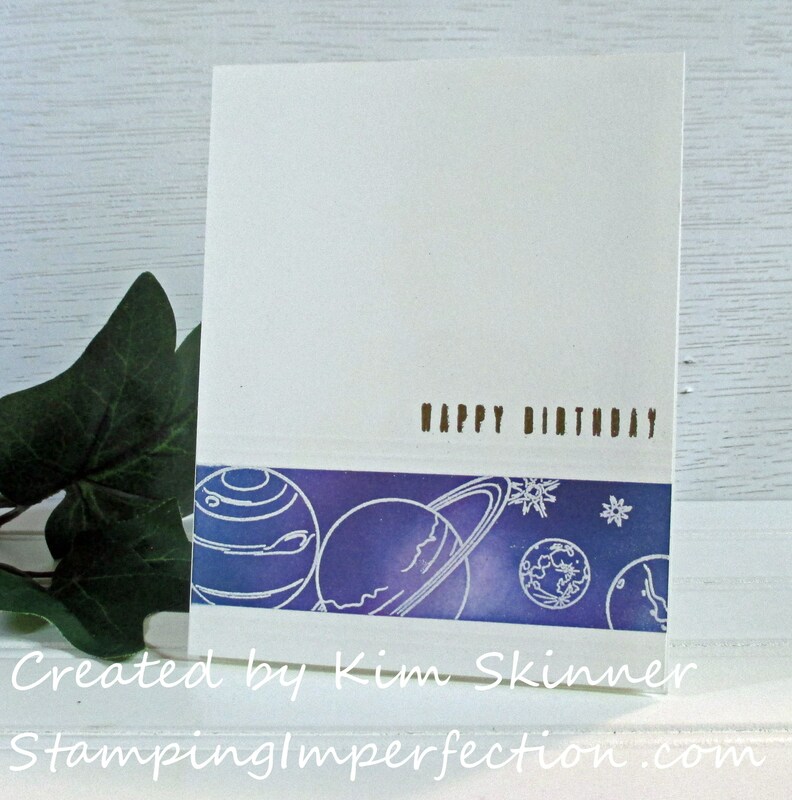 But I do hope that you have fallen in love with the Space Travel and the Happy Dreams stamp sets!! WAY to rock your final challenge for Level 1!! I truly enjoy this post you explained each card it great details and creative process! I also love each one of the cards that you post… although the first and third speak to me the most (not sure why!!). I guess I like the sophisticated and concise design! It is generally more challenging to create masculine cards, but you ACED it!! Congratulations on completing this challenge! Hi, congrats to you, I loved number 5, it is so clean and fresh, less is truly best for this card, your color choice was spot on. Good luck you will do great. Thank you so much for stopping by! I like card 5 also. I just had to make one floral and I do love a clean and simple card.